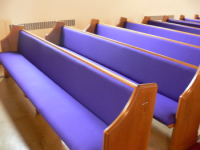 Are your church pews still in good condition structurally but need a fresh, new look? 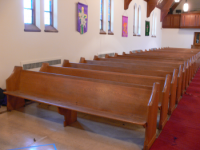 Our professional pew upholsterers will come to your location and upholster your existing church pews onsite.We have been upholstering pews on-site since 1977. Church Pew Upholstery is an affordable way to make your pews look new again. We use only durable, commercial grade fabrics and high density poly foam. Our fabrics are manufactured in the USA and offer stain resistance and warranties that range from 10 years to Lifetime. 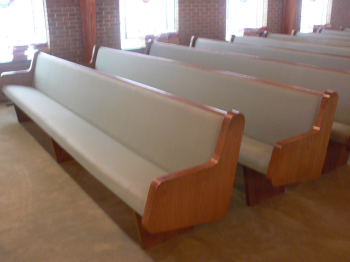 Upholstery for solid wood pews. Touch up, pew repair and complete pew refinishing. Stain resistant, commercial grade Fabrics with Lifetime warranties available. High density, non-loaded, virgin poly foam for years of comfort. All work performed on-site without interruption to Sunday services. 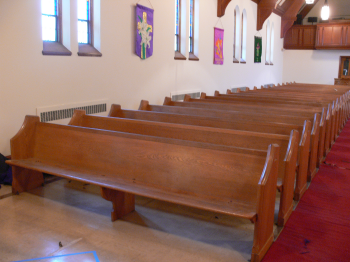 A fraction of the cost of new pews. 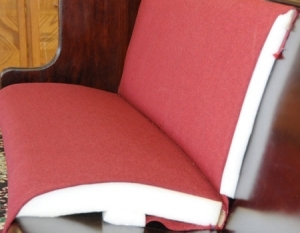 New foam for extra comfortable seating. 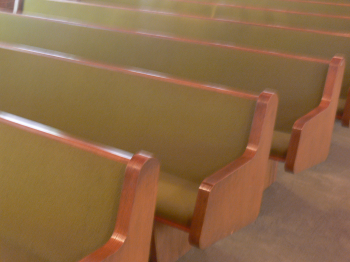 New stain resistant fabric made specifically for church pews. 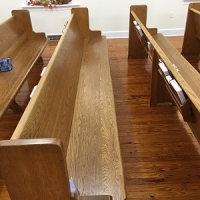 Maybe you don’t like the thought of attaching fabric and foam to your beautiful solid wood pews. If so we can provide reversible loose cushions or pew form cushion as well. 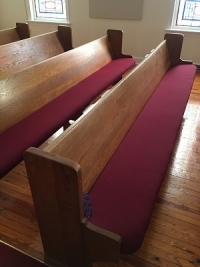 Call us today at 800-736-3113 or use our contact form and one of our experienced pew upholstery specialist will gladly assist you with information and pricing.